Unlike larger building companies who handle many clients simultaneously, we deal with a smaller number of clientele, which enables us to offer a superior level of customer service. For 27 years every client of Skills Unlimited Services has always been treated with the upmost respect and consideration. We assure you maximum attention and support throughout the entire project process, from the initial consultation though to you proudly revealing your renovation to your family and friends. From small homes to large full-size estates, Skills Unlimited Services can renovate or extend any kind of home, even heritage listed buildings. Each project is custom built to meet the needs of your requirements and the Australian industry standards. Our professional experience and our attention to detail allow us to produce the best home renovations and extensions in and around the Melbourne area. We pride ourselves on being helpful and knowledgeable; our team is really passionate about delivering you the lifestyle you deserve and a large return on investment to increase the value of your property. When you call the office you are dealing with our small team, you won’t get past around from department to department if you have any questions. We work closely with our team of craftsman to ensure you are always kept up to date with your project. We take tremendous pride in our workmanship. After 27 years of service in Melbourne, we know what to consider from product choice to artistry methods. Our stringent quality control measures across all steps of the project, ensure that your project is always of exceptional high calibre, meaning that your renovation will meet even the most disconcerting high standards. When you hire our professionals to complete a project for you, you will be pleasantly surprised that we include everything in our quotes, no hidden fees or charges. We believe in full disclosure with our quotes and prices. That’s our guarantee. We give the type of personalised service that isn’t commonly found anymore. We turn up when we say we will, do what we say we will do and clean up after ourselves. No swearing, no smoking, no nonsense. When choosing a builder for your project you want to have confidence that it will be built properly and trust that it's built to current building codes but most of all you want a builder who has the experience that affords the insight that only comes with time. Skills Unlimited Services is exactly this type of builder. Whether the job be big or small you need a certified Master Builder to get the job done right. 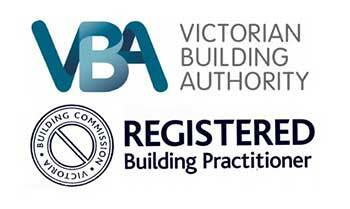 Skills Unlimited Services are a member of the Master Builders Association of Victoria which means you can be trust that our projects are built to highest standards. As a registered building practitioner with the Victorian Building Authority you can build with confidence by choosing Skills Unlimited Services as your builder. We've been providing quality craftsmanship for over 27 years but don't just take our word for it, read some of our clients testimonials.